I often wash a good steak down with a good pint of Guinness. Brown sauce is also a good complement to a steak, though I rarely find a bottle in the house... HP and Guinness had a popular partnership with their HP Guinness Sauce for a relatively short time. Unfortunately this partnership came to an end, but it didn't mean that was the end of Guinness Sauce, only that incarnation. This new incarnation has some leanings towards that sauce, but has been produced by AB World Foods in Lancashire for Guinness. I poured a can of Guinness into my beer mug and dolloped a decent blob of this sauce next to my steak and chips. Sort of like a liquid Guinness steak sandwich. I could identify the Guinness Beer in the sauce, especially the barley as it washed around my mouth whilst chewing my succulent steak. There was also a sweetness mixed with the molasses that drew out the flavours in the red meat as well as complemented my chips. 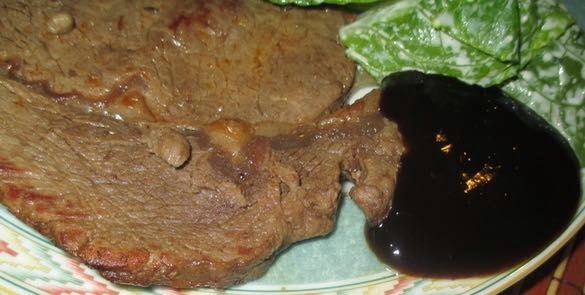 There was an almost dark barbecue sauce flavour to this rich Guinness Sauce that reminded me of an American steak sauce that I was lucky enough to sample sometime back. Now we have just the sauce for your steak over here, and I reckon it would go rather well with a rack of ribs or some chicken wings. In fact I'll give it a try with them as soon as I am able. It's a very versatile sauce. Lip-smackingly rich, sweet, tasty and enjoyable by anyone! Cheers!